Tanto knife measures 11 3/4"
This warrior's package features an aggressive swooping tanto knife with full tang construction, three mini-kunai throwing knives, and two bear claw style finger claw rings. A hard sheath with belt loop is included to carry all of these weapons into battle with ease. 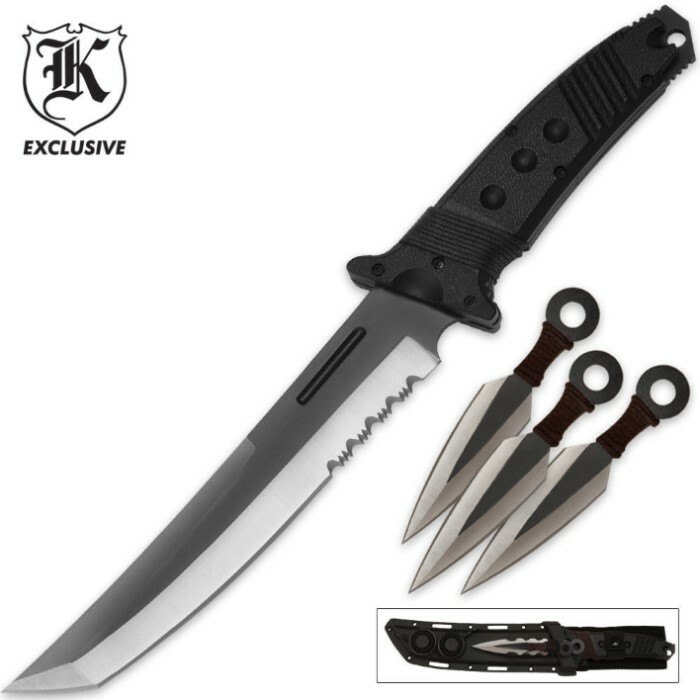 The tanto knife has a stainless steel blade with combo edge, two-tone finish, and measures 11 3/4 in. overall. Each of the three throwing knives measure approximately 4 in. overall, feature a matching two-tone finish, and dark cord wrapped handles. Just received the knife today. I knew the kunai were small but were not properly sheaved; I had to press the holder for the kunai in by hand so the throwing knives would stay in place. I did a shake test to see if any thing came loose and the rings came off. I will have to find a way to secure the rings. The tanto was not as sharp as I expected. The kunai are as sharp as the tanto blade. I was surprised to find a bear claw push knife hidden in the handle, (my son found it first). Overall I am giving a rating of four stars out of five because, I was not expecting a hidden push knife and the kunai to be discarded in the delivery box and the blades not being sharp like they should be. the knife is of the decent quality. It did not ship as sharp as the one they demo. The snap for retaining the knife is useless. The finger spikes foam liners fall out. The throwing knives are placed in a holder that is not well designed and takes some trial and error to get them to fit back in at all, much less so they won't fall out. I found interesting that they do not mention the small punch dagger in the pommel. I love this knife. By far this is the coolest knife I own. The mini throwers are great and so are the spikes. But after I used the knife a lot it turns out there is a mini push dagger in the back of the knife handle. I think you should make a new video showing the dagger. Over all it's a amazing knife. Great set for the price. Knife is heavier than I thought which is a good thing. Push blade on end of knife handle was a cool surprise and bear claws fit well. I would recommend this set for the price. love the knife its very good, it didnt come sharp, but thats ok ez to sharpen, the little throwers, didnt think they were gonna be that small but there actually pretty sharp and stick pretty well. Would love to give it 5 stars but there were a few ups and downs. First, the throwers. As just throwing knives, they are well balanced and seem to hit on point. However the placement of the throwers on the sheath is shakey at best, and from what I've tried if you attempt to remove just one of the onives the other two fall out. The claws are also well designed and sturdy, but again the placement leaves something to be desired. The knife itselfe is very nice looking peice with sturdy construction, however the edge needed a great deap of work before it was acceptabley sharp. The handle of the knife feels sturdy enough bit is a bit small for.my taste. Also the shape makes switching your grip very precarious. As for the tiny pushdagger, if you plan on using this, plan on some stitches. Overall is a sturdy peice of steel, but if you're planning on actually using it, plan on modifying it a bit. Lastly, it arrived 3 days late.....what's up with your shipping, BudK?